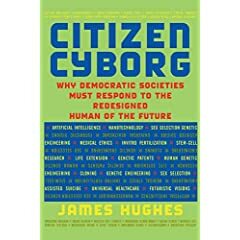 Following is an interview with James Hughes, sociologist and transhumanist of note, and author of Citizen Cyborg (Westview, 2004). > 1. What's new with you? Yikes. About fifty things a day. I feel like I'm about to be swept under by accelerating change all the time. Need to spend more time on my meditation cushion. > 2. What is transhumanism, and why does it matter? Transhumanism is the merger of our oldest and deepest aspirations to transcend the limiitations of our mind and body, to be wiser, happier, healthier, longer lived and to have more capabilities, with the democratic values and scientific culture of the European Enlightenment. We advocate for everyone's right to use safe human enhancement technologies even if we move beyond some people's limited ideas of what humans are supposed to be. > 3. In recent e-mails, we were talking about the relationship between transhumanism and Buddhism. Can you suggest a few points of synthesis between the two? A few points of fission? we apply neurotechnologies and life extension. > 4. If I may say so, it looks like we'll all be speaking Mandarin in 100 years. How do China's global (and extraterrestrial) ambitions impact the transhuman agenda? One of my nightmares is an authoritarian China using coercion to achieve the full benefits of enhancement technologies for their population, and using neurotechnologies to remold their citizens into compliant workers and soldiers. The answer of course is not for the West to ban these technologies, but to make them as widely available to free people to use in freely determined ways, so that we get the even greater advantage to be had from a billion individual experimenters. China also highlights the importance of a global campaign of democratization and political globalization, to ensure human rights, democratic accountability, collective security and fair, sustainable development. Only a democratized world united around a democratic, accountable transnational authority can stand down the new forms of enhanced authoritarianism we are sure to see. > 5. In the broadest sense of the word, will posthumans need libraries? > 6. There seems to be some really exciting academic work going on that's affiliated with or carried out by transhumanists -- looks like everything from ethnography and gerontology to nanotechnology and engineering. What are the fields that most excite you, and why? One of the advantages of being a sociologist is that I can legitimately follow and be excited about everything. Like everybody else, my personal hopes for life extension and medical progress focus much of my attention there, and I'm trying to get more knowledgeable about cognition and neuro-physiology for my book Cyborg Buddha. > 7. I listen to your Changesurfer Radio, and have enjoyed it for years. There's no denying that you're a science-fiction fan, is there? Who are you reading right now? Just finishing the 1600 pages of Peter Hamilton's Pandora's Star and Judas Unchained, which projects a very plausible transhuman future and polity under serious pressure, implacable threat from hostile aliens. Precisely the kind of imagining we need for the challenges ahead. Next up is Ken MacLeod's Learning the World and Verner Vinge's Rainbow's End. > 8. Okay. I want to ask you about military and police applications of the transhuman or posthuman vision. The notion of a world in which the world's major states have bundled the technology up and use it to control their populations and wage wars against each other is pretty scary. How can the transhumanist movement, and the technology associated with it, be made widely and democratically available without also making it available to criminals, autocrats, and terrorists? We can't. We will have to weigh the risks and benefits of wide access to each technology. Making life extension tech widely available has low risks and wide benefits; yes bad guys will live a long time, but so what? Making neurotechnology widely available has more risks, so we will just have to punish those who use them for bad ends. Making nano-weapons widely available has low benefits and high risks, so I would restrict their possession to democratically accountable military and police. Etc. > 9. Realistically, does the post-Singularity world look more like a Bill Joy or a Ray Kurzweil scenerio to you? muddle through to a better place, but it will be wild and dangerous, and will require constant effort and attention. > 10. What sort of positive collaborations can you see between transhumanists and librarians? Librarians can buy lots of future-oriented literature and non-fiction for their libraries. Transhumanists can work to ensure that they don't get caught up in what Jaron Lanier calls "digital Maoism," proposing the complete replacement of expert knowledge by collective knowledge aggregation software, and thereby contribute to the denigration of the important role librarians and other knowledge experts play. > 11. One more question: what sort of projects are you working on for the rest of the year?